Thrombin Generation Assays (TGA) are based on monitoring the formation of thrombin by means of a fluorogenic substrate upon activation of the coagulation cascade by tissue factor. This assay can be used to monitor hemophiliacs during inhibitor bypassing therapy, to monitor anticoagulation therapy and to determine states of thrombophilia. 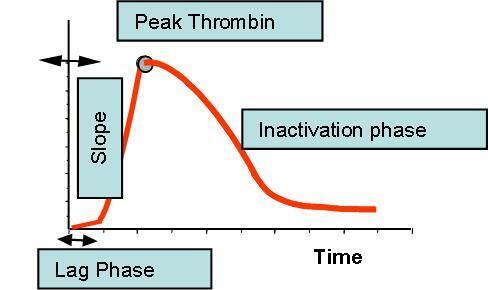 The use of Thrombin Generation for such diverse applications is made possible because the assays of Technoclone measures the whole kinetics of thrombin generation not only during the initiation phase of thrombin formation with the end point fibrin formation, but also during the phase of down regulation of thrombin formation and inactivation of the formed thrombin. Thrombin Generation Assays (TGA) are therefore an universal tool for the analysis and monitoring of the haemostatic system on an individual basis. TECHNOTHROMBIN® TGA Assays are RUO Assays for the use on Fluorescence Microplate Readers. They are available in kit format (with 3 different triggers) or as modular reagents. The different available triggers should give you a maximum of flexibility in your research work. Applications for several readers and the corresponding evaluation software can be downloaded from the customer area. Ceveron® TGA reagents are CE marked and optimized Thrombin Generation Reagents for the automated analyzer Ceveron® alpha TGA who is equipped with a fluorescence measurement module (TGA Module). Thrombin Generation on Ceveron® alpha TGA is measured with a special adapted TGA fluorimetric module.